Like this Q&A? Share it with your colleagues. Visualization and simulation technologies have vastly improved over the past two decades. Costs continue to drop, making advanced visualization solutions more accessible than ever. Bill Schmidt, AVISPL Sales Director and Visualization Advocate, answers questions about trends, technologies, and what it means for an array of businesses and organizations. Question 1: What is advanced visualization? 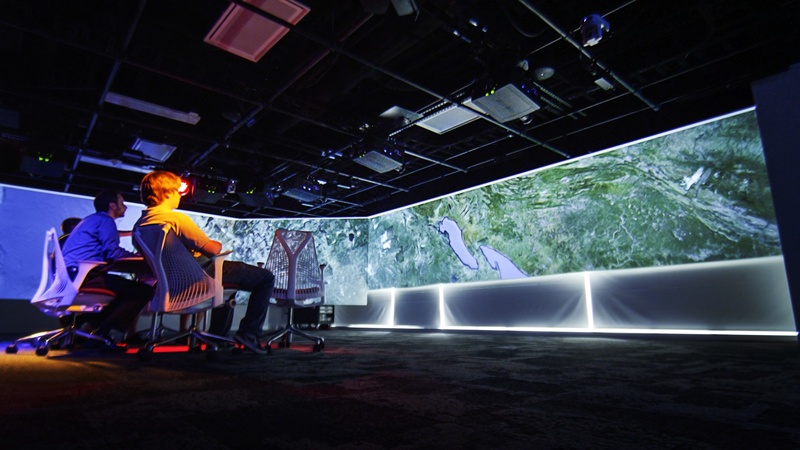 Advanced visualization is the term for display system technologies and solutions that can immerse people in simulated environments. In today’s world, data is very easy to acquire, making it quite plentiful. What do you do with that data? How do you manage it? How do you put it to best use with the investment that you made to gather it? Advanced visualization offers the toolset to best visualize that data. Depending on your goals, you can view that data in a simulated 2D or 3D environment. Viewers can become immersed in virtual realities and see what the information could look like in real life. Question 2: How can organizations use visualization? 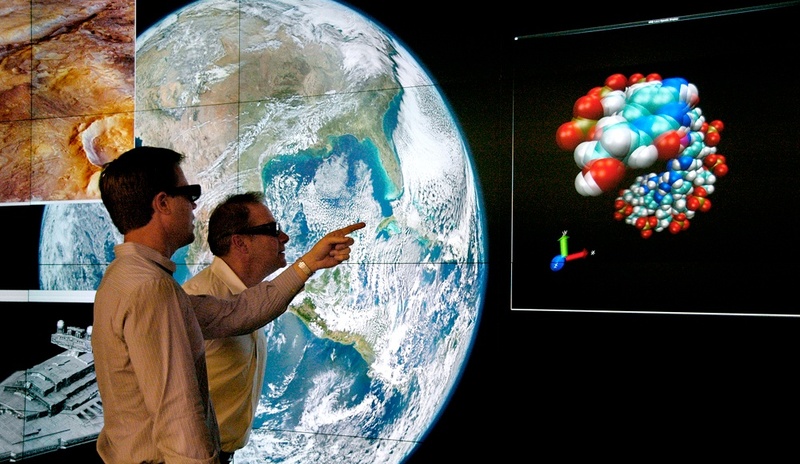 Advanced visualization is being used in a number of environments from corporate to higher education to science and medicine. Hospitals and medical schools train doctors in complicated procedures using virtual patients. Vehicle manufacturers can design and test cars to optimize performance, handling, and safety. Oil and gas companies use visualization to make decisions about when and where to drill. Scientists can recreate structures for study on any scale, from nanotechnology to astrophysics. Question 3: What are the benefits to companies that implement advanced visualization solutions? training, advanced visualization improves patient safety because it has been proven that students can learn better and develop better skills through competency-based simulations. In automotive and other kinds of manufacturing facilities, engineers are able to create virtual prototypes, shortening the design cycle. Also, when you cut out modeling phases, you can run more tests, improving the end product. A less obvious benefit is that advanced visualization is improving the way people collaborate. With this technology, several people can collaborate through touch on the surface of one display wall or several remote engineers can work on a single virtual design simultaneously. Question 4: What are the technologies that make up an advanced visualization solution? It really starts with the software. There is always some visualization software piece that places data into the visual world. The second piece is a computer system that has enough CPU and GPU power to run the visualization software at frame rates and pixel densities high enough that it all looks lifelike. Then you get into the display and projection technology. A lot of the display systems we see in our everyday lives are very good, but they don’t have the kind of fidelity to allow suspension of belief. Advanced visualization requires higher pixel density, as well as varied screen shapes and sizes. You need projectors that can render colors appropriately and be matched and blended on multiple screens. Finally, there are the peripheral technologies that take viewers into deeper levels of immersion. From 3D glasses to sensors that track touch and movement, these accessories allow the viewer to become part of the simulation. Question 5: Why are these solutions becoming more commonplace? Advanced visualization just makes work easier, and the technology is better, faster, and cheaper than ever before. When these technologies were in their infancy 15 to 20 years ago, the computers that ran simulations cost $1 million; today you can get that kind of power for $50,000. The cost per pixel is way down, too. There has also been a lot of progress in visualization, so you don’t have to feel like you’re a pioneer. You have information to do a project the right way. Finally, data is cheap to obtain, but organizations now need to find ways to look at all of it. The ability to visualize it is key to its usefulness. Question 6: What is the process to design, build, and integrate an advanced visualization system? AVI-SPL uses a process I call “define, design, validate, deploy.” It’s a considered approach where you learn from the stakeholder community what they’re trying to accomplish. This reciprocal process results in very concise data that allows us to make a successful technical design. AVI-SPL has a deep bench of design talent, so we can assign projects to the appropriate team and even multiple teams. If you want a solution with positive long-term results, consider partnering with an integrator that uses such a holistic approach. Question 7: What do you see for the future of visualization in healthcare, government, and enterprise? One of the most exciting breakthroughs in this technology is happening in medical immersive simulation centers. Some forward thinking medical schools are blending virtual reality with traditional medical simulation to transition from a lecture teaching model to a simulation model to develop competency-based evaluation. Again, the desired result is to improve patient safety. Visualization is changing the way we train professionals in medicine, science, engineering, and other disciplines. People will graduate with a lot of practical, hands-on experience that they’ve gotten through simulations that closely approximate what they’ll run into in the real world. It’s exciting and satisfying to know you were involved in a project that might save someone’s life. Another interesting area for visualization is in product design and packaging. It is costly to print test packaging and set up mock shelving in warehouses, for instance. So, virtualization saves a lot of time and money while allowing the same level of testing. Similarly, retail stores will soon be able to fill virtual shelves with virtual products. Customers will be able to physically visit a kiosk and examine a simulated package and even read the label. In some places they can even virtually “try on” clothes. Consumers may soon be able to do their shopping in virtual malls or grocery stores while waiting for mass transit or elsewhere. Virtual stores will further reduce costs by eliminating physical merchandising and by preventing shoplifting. Finally, you’ll see training simulations become more commonplace. There are so many fields that can benefit from virtual education and training. The potential for advanced visualization here and in so many areas is immense. To speak with AVI-SPL about advanced visualization, call (866) 559-8197.